We are pleased to announce that the 2019 NWA Annual Education and Training Conference and Exhibits will be held in Baltimore, Maryland, April 7 – 10, 2019. The venue will be the Baltimore Marriott Waterfront, located in Baltimore’s beautiful Harbor East neighborhood. Surrounded by monuments, museums, and historic and charming neighborhoods, Baltimore is brimming with cultural, culinary, entertaining and historical attractions and activities to experience. This Conference will offer an excellent opportunity to acquire new skills and to network with an estimated 1,000 of your peers, and colleagues along with exhibitors who provide WIC related products and services for your participants. The conference will also offer an opportunity for attendees to hear from USDA officials and to dialogue on relevant updates and challenges that the program faces. For the rest of the conference, you will have the opportunity to choose from 30 general and concurrent sessions that is sure to expand your professional skills and knowledgebase to equip you to face coming WIC challenges and to take advantage of current and future WIC opportunities. Registration will be on Saturday, April 6th from 4:00 – 6:00 pm The conference will formally begin at 9:30 am on Sunday, April 7th. There will be meet and greet events for state agency staff Sunday morning before the conference starts. The conference will end at 1:00 pm on Wednesday, April 10th. For questions, please contact the NWA National Office at 202-232-5492. We'll be happy to assist. Sarah Widor, the Director of Supplemental Food Programs Division, sent a letter to all state agency WIC directors supporting the 2019 Annual Education and Training Conference & Exhibits. This letter confirmed that WIC Program funds may be used to fund travel expenses and registration fees for this conference. 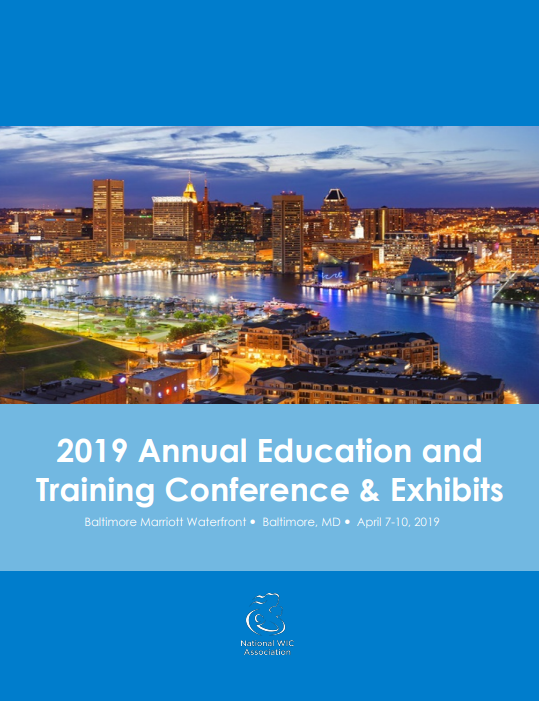 The 2019 NWA Annual Education and Training Conference & Exhibits will be held at the Baltimore Marriott Waterfront in Baltimore, MD April 7 - 10, 2019. The hotel address is: 700 Aliceanna Street, Baltimore, MD 21202. To make your hotel reservations online, please use the following link: https://book.passkey.com/go/NationalWICAssocRoomBlock. You can also make your hotel reservations by calling (410) 385-3000 and identifying yourself as a 2019 NWA Annual Conference attendee to receive the negotiated conference rate. PLEASE NOTE THAT THE CONFERENCE HOTEL IS CURRENTLY SOLD OUT. The overflow hotel is the Courtyard Baltimore Downtown/Inner Harbor. More details below. NWA has negotiated a special room rate of $189.00 per night plus a nightly room tax currently set at 15.5%. Note that this tax rate is subject to change without notice. The cut-off date for these rates is March 15, 2019. After this date, reservations will be subject to the hotel’s prevailing rates. We encourage you to make your room reservations early to ensure that you will be in the host hotel at the guaranteed room rate. Upon checking in, each guest will be asked to provide a valid government issued ID along with proof to which the room reservation was made. The hotel requires a major credit card to guarantee your room reservation, and first night's deposit (including taxes) payable at the time the reservation is being made. Room cancellations must be received at leaset 72 hours prior to your arrival date to avoid being charged the first night's room rate and applicable taxes. Hotel check-in is 4:00pm and check-out is 12:00pm. The hotel can arrange to have your bags stored depending on room availability. Late check-out may be requested upon arrival. The hotel offers on-site valet parking for all registered guests at a daily rate of $45. On-site parking is also available for $8.50 per hour or $26 daily. Note, rate may change without notice. The 2019 NWA Annual Education and Training Conference & Exhibits overflow hotel will be Courtyard Baltimore Downtown/Inner Harbor in Baltimore, MD April 7 - 10, 2019. The hotel address is: 1000 Aliceanna Street, Baltimore, MD 21202. To make your hotel reservations online, please use the following link: https://www.marriott.com/event-reservations/reservation-link.mi?id=1553001873379&key=GRP&app=resvlink. You can also make your hotel reservations by calling (443) 923-4000 and identifying yourself as a 2019 NWA Annual Conference attendee to receive the negotiated conference rate. NWA has negotiated a special room rate of $185.00 per night plus a nightly room tax currently set at 15.5%. Note that this tax rate is subject to change without notice. The cut-off date for these rates is March 26, 2019. After this date, reservations will be subject to the hotel’s prevailing rates. The Baltimore Marriott Waterfront and the Courtyard Baltimore Downtown/Inner Harbor are accessible via Baltimore/Washington International Thurgood Marshall Airport, and is about 12 miles, from the airport. Shuttle and taxi cab services are available at the airport. The current estimated taxi/cab fare is $45 (one way). Please note that the hotel does not provide shuttle service. If you don't see a presentation, we are either awaiting permission or the presenter did not give permission. Please find the posters here. Click here to view a current copy of the Attendee Listing. Please note that this attendee listing is sorted by state and last name. Help us improve the conference next year by rating individual sessions and speakers. You can give each event a 1 to 5 star rating, leave comments, and answer event-specific questions, all within the app. This information will be shared with the presenters and be used to help us evaluate proposals for next year. Use interactive maps of the exhibit hall and meeting spaces at the Baltimore Marriott Waterfront as well as area attractions. Did you just meet someone and wish you got their business card? Do you have a follow-up question for an exhibitor? Do you want to meet later with a person you met at the conference? Go to “Attendees” in the app and search for them. See their social media and other public contact information. Then message them in the app to connect! The app is available for download from the Apple Store or Google Play store. You are able to download the app now and set it up before you arrive at the conference. You can create a user account and sign in from one or multiple devices. Perhaps you don’t use a smart phone but have a tablet at home or work that you could bring to the conference in order to use the app. Click here for instructions on getting and using the app. We invite you to participate as an exhibitor and/or sponsor at our 2019 Annual Education and Networking Conference and Exhibits. Get a discount on your booth by becoming a Sustaining Member of the National WIC Association! Sustaining members receive deeply discounted exhibitor rates for all NWA conferences. There are six membership tiers to choose from, and all of your employees can take advantage of the benefits. Sustaining Membership benefits can be found in detail here. To receive the NWA Sustaining Member exhibit rate, you must be a sustaining member at the time of submitting the exhibit contract/application and at the time of the conference itself. To become a sustaining member or to renew, contact Emily Gilcher, egilcher@nwica.org, 202-232-5492, with questions. If you are seeking to introduce your products and services or an alternative promotional strategy to a new or existing audience, this conference offers several affordable options to meet your marketing needs. Demonstrate your commitment to promoting quality public health nutrition for women, infants and children. Platinum, Gold, Silver & Bronze Sponsors have first choice to all available exhibitor spaces. Let us know what you thought of the conference! Take our conference evaluation survey. The NWA Annual Education and Networking Conference & Exhibits was held at the Baltimore Marriott Waterfront.